Sandra A. Gutierrez: Where's the Goat? Today we welcome a guest post from Sandra A. Gutierrez, author of Latin American Street Food: The Best Flavors of Markets, Beaches, and Roadside Stands from Mexico to Argentina. From tamales to tacos, food on a stick to ceviches, and empanadas to desserts, Sandra A. Gutierrez’s Latin American Street Food takes cooks on a tasting tour of the most popular and delicious culinary finds of twenty Latin American countries, including Mexico, Cuba, Peru, and Brazil, translating them into 150 easy recipes for the home kitchen. These exciting, delectable, and accessible foods are sure to satisfy everyone. In the following post, Gutierrez shares the story and ingenuity behind one of Latin America’s most famous sandwiches. You can see her prepare the famous Chivito Uruguayo in this video! I had a tremendously fun time writing the chapter on sandwiches for my book Latin American Street Food: The Best of Markets, Beaches, and Roadside Stands from Mexico to Argentina, because of the great stories behind some of the most famous sandwiches. For starters, many Latin American sandwiches are named after the people who inspired them—and some of them even have surnames! One of the most famous sandwiches in South America is also one of the most fun (and messy!) to eat: the Chivito Uruguayo. In Spanish, chivito means baby goat, but there’s actually no goat to be found in this sandwich. Why the name? Well, as the story goes, there was a restaurant owner by the name of Antonio Carbonaro, from Punta Del Este, Uruguay. One evening in 1940, a customer came into the restaurant asking for a goat sandwich like one she remembered having nearby. Mr. Carbonaro had no idea what sandwich she was talking about. The restaurant didn’t even have any goat meat. To make matters worse, the place was full of people and they were in the middle of a storm that had cut electricity. What could they do? The owner, who didn’t want to turn his client away, talked to the chef, and said chef sent out a beef and ham sandwich. The customer ate it and loved it. She was so happy with her “goat” sandwich that soon word spread about this delicious creation and in a When Harry met Sally way, everyone started experiencing an “I’ll have what she’s having” moment. Soon the restaurant starting selling hundreds of them each day. The sandwich came to be known all through South America and to date you’ll find it served in the streets. Normally carts (or stand alone kiosks) that sell these towering creations offer a gargantuan choice of toppings and condiments to go on it. That is due to the fact that this sandwich holds everything but the kitchen sink! To start with, there is the beef and ham but then the options begin to pile up (literally). There’s Canadian bacon, fried or hardboiled eggs, roasted peppers, artichoke hearts, onions (sautéed or raw), tomatoes, hot peppers and all sorts of flavored mayonnaise that oozes down the sides of the sandwich each time you bite into it! And that’s only the beginning because just in case you’re still hungry after eating one, most places offer you full portions of perfectly crispy French fries to go along with it (and I also have a killer recipe in my book for fries). There are many Latin American sandwiches that have risen to great fame, but few stories are as legendary as that of the Chivito Uruguayo. How legendary is this sandwich, do you ask? So famous that Mr. Carbonaro’s death obituary included a mention of it, in case there was any doubt as to who had created it. And that’s because in Latin America we take our sandwiches very, very seriously. So make yourself one of these famous sandwiches and be prepared: it’s huge, it’s messy and it’s a load of fun to eat! Goat Sandwich (Chivito Uruguayo). Photo by Fred Thompson. From Latin American Street Food: The Best Flavors of Markets, Beaches, and Roadside Stands from Mexico to Argentina, by Sandra A. Gutierrez. Copyright © 2013 by Sandra A. Gutierrez. In a small bowl, combine the mayonnaise, hearts of palm, and capers; set aside. In a nonstick skillet, heat half of the oil over medium-high heat; cook the beef for 1–1 ½ minutes per side (for medium rare), or to desired doneness; remove the beef from the pan and set aside. In the same pan, cook the bacon on both sides until golden, about 1–2 minutes total; remove the bacon and set it aside. Reduce the heat to medium; add the remaining oil to the pan and sauté the onions until lightly golden, about 3–4 minutes (or leave them raw). 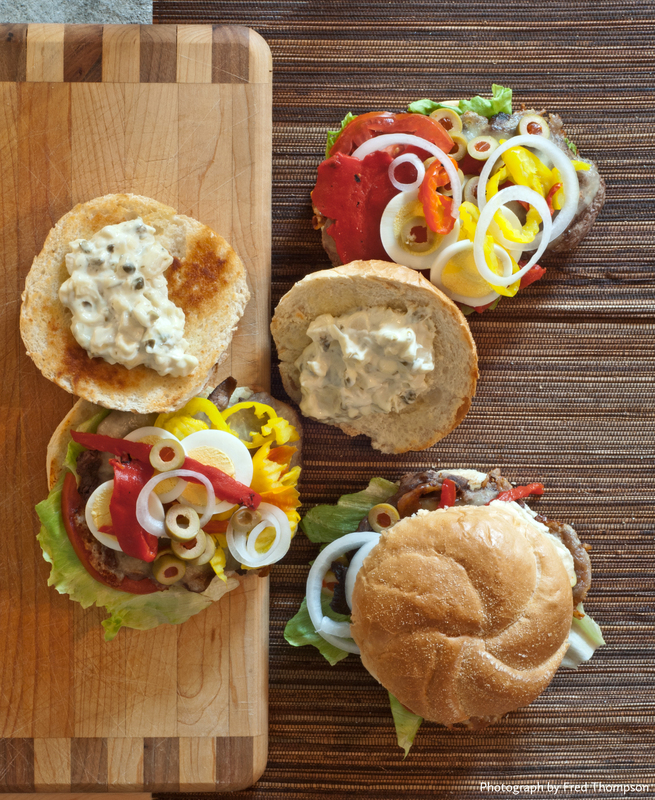 To assemble the sandwiches, spread the bottom of each bun generously with the prepared mayonnaise. Top with a slice of beef, bacon, ham, and mozzarella; set them on a baking pan and place them 1 inch from the broiler for 2–3 minutes or until the cheese is melted and has begun to brown. Remove the sandwiches from the broiler; top with the lettuce, tomato, hard-boiled eggs, onions, and olives; add peppers and more mayonnaise, to taste. Replace the tops of the buns and serve immediately. Sandra A. Gutierrez, who grew up in the United States and Guatemala, is a food writer, culinary instructor, and recipe developer. She is author of Latin American Street Food: The Best Flavors of Markets, Beaches, and Roadside Stands from Mexico to Argentina and The New Southern-Latino Table: Recipes That Bring Together the Bold and Beloved Flavors of Latin America and the American South. She lives in Cary, N.C. Visit her website sandraskitchenstudio.com, and follow her on Twitter @sandralatinista. Check for upcoming events on her author page on the UNC Press website.